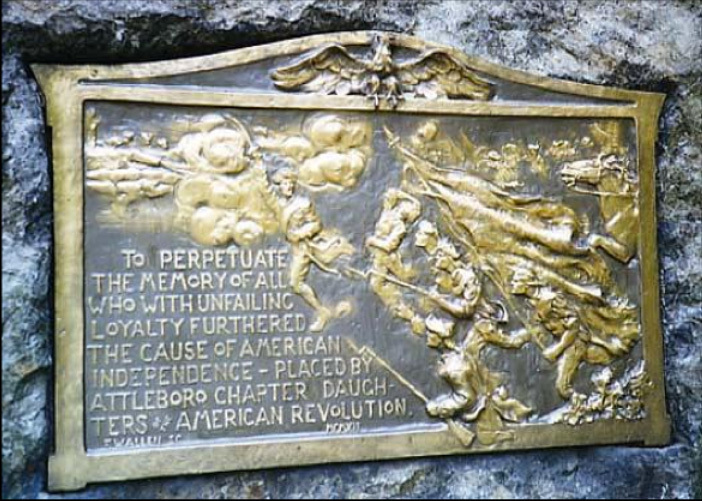 Frederick Warren Allen’s first commission for work was a bronze memorial plaque to be placed in Capron Park in his hometown of Attleboro, Massachusetts. He was still living at home, a young student at the School of the Museum of Fine Arts in Boston, when he won the commission in a competition with the prestigious silver companies Gorham Co. and Reed and Barton Co.. The news of his victory must have been very exciting to the young artist. Committee members of the Daughters of the American Revolution had approached him in September of 1911 to ask for prices on a memorial to the soldiers. By December the commission had been awarded and the boulder chosen on which the bronze tablet would be mounted. Allen started sculpting and designing it in September, worked on it through April and May and had it cast in June. D.A.R. War Memorial, original clay sculpture. 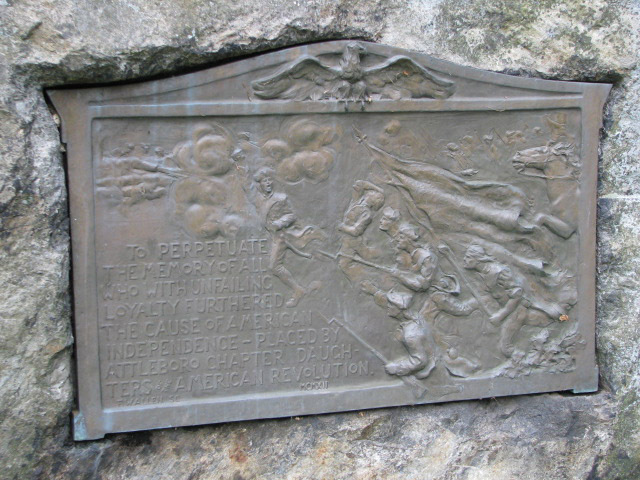 The scene shows the brave Minutemen charging out of the woods, the not-too-distant cannons blazing as the British soldiers shoot at them from behind a stone wall. The air fills with clouds of smoke as they charge into battle with flags flying and rifles fitted with bayonets in hand to win freedom for the new colonies from British rule. Entering the rectangular frame from the lower right corner, the action moves diagonally toward the British in the upper left. The coat and gun of the closest soldier extend out over the frame, making it seem that the viewer is entering the into the battle scene with the men. Movement is created by the forequarter of a horse charging ahead, the running figures of the men with their leader pointing his sword forward and upward and a large billowing flag. Emotion is felt looking at the intent faces of the patriots, the figure of one arching backward holding his head just as he has been wounded. The design divides the rectangle on a diagonal into thirds. The left third gives weight to the importance of the inscription on a smooth ground, the lettering fitting like a puzzle into the edges of the scene in the middle third, which creates the excitement of the action moving forward. The right third is bordered by the flag, carried on a pole placed diagonally, starting almost at the bottom right corner, it’s finial at the top center. The right third adds details to the scene with the horse galloping out from in front of a large tree trunk, the textural elements in the suggestion of a line of soldiers in the distance and the dominating design of the flowing waves of the huge flag. The busy scene is contained by a sturdy architectural flat-faced frame anchored with plinth blocks in the bottom corners, topped with a curvilinear header with pointed outside corners. The arched center portion allows space between the rectangle and the high point of the arch where a spread eagle perches, the great American symbol, its claws gripping the frame. 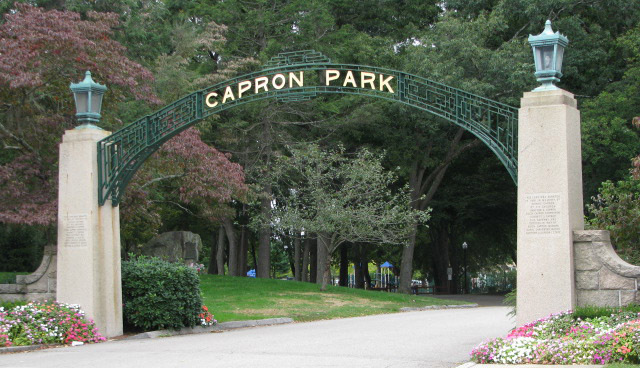 Sculpting started in September 1911, cast in June, 1912, Base: Granite boulder chosen by Allen, placed at Capron Park and fitted to receive the tablet. 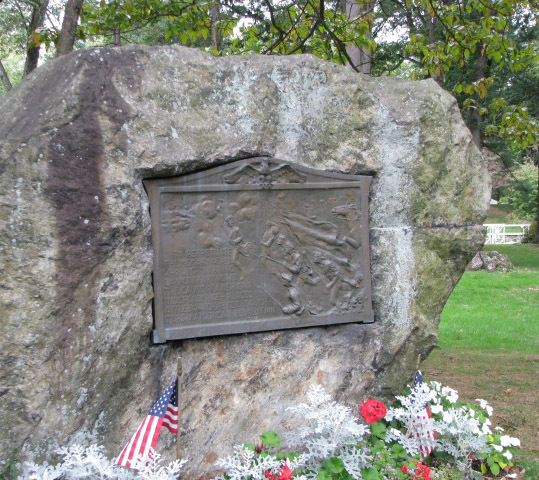 Description: A large granite boulder with a rectangular bronze relief plaque featuring a battle scene of charging patriots with swords raised and banners held high. In the upper left corner of the relief is a cloud of smoke from the cannons of British troops. In the center of the relief is a soldier who has just been wounded. The top of the relief is adorned with a small eagle with its wings spread.